Holi is an ancient Hindu festival that celebrates the coming of a new season and the joyous victory of spring over winter’s evil darkness. For thousands of years in India, people have colored each other on this holiday with gulal, a colorful powder inspired by the legend of Lord Krishna, who doused his beloved Radha’s face with color to make her lighter skin resemble his. Today, this playful expression of love has turned into joyous battles around the world, making anyone anywhere fair game to be smothered with color. 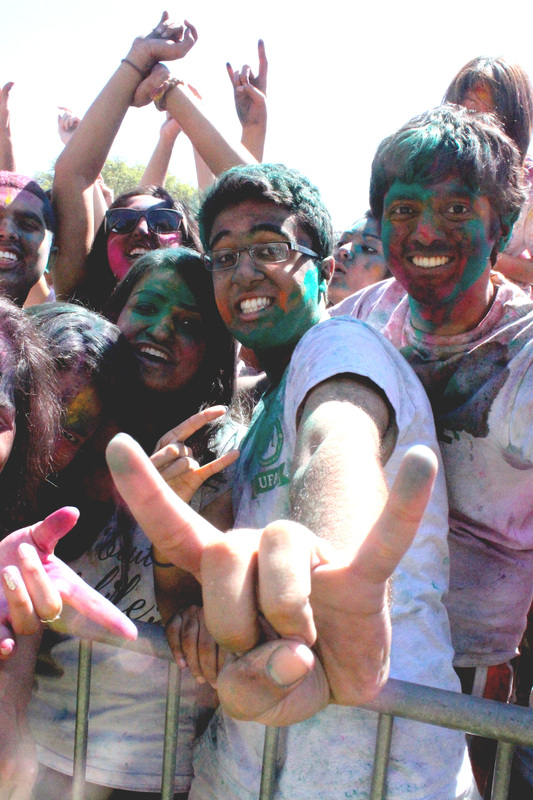 About 7,500 Austinites, dressed in all white, gravitate across the UT campus toward the LBJ Lawn, lured by the music pulsing within a colorful haze of the Univeristy's Hindu Student Association's annual Holi event on March 30.The festival was delayed a week due to weather, but it was worth the wait. 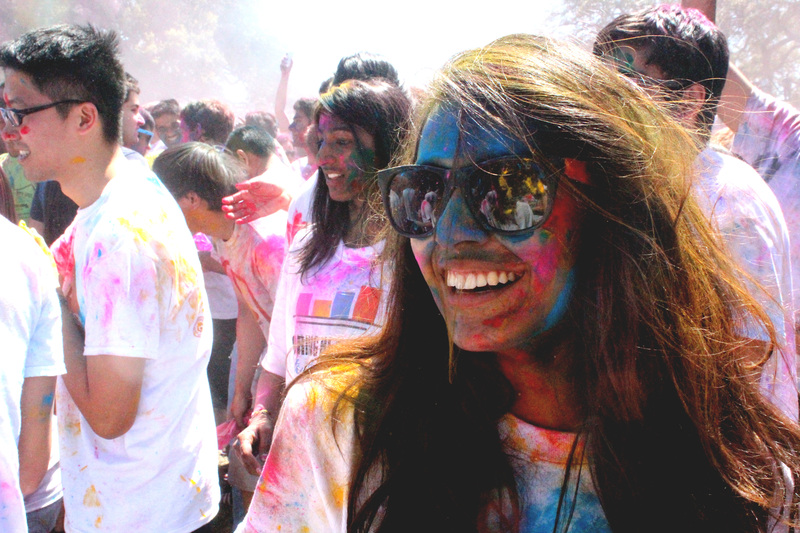 Abhijith Sreerama, Holi co-chair and UT alumnus, explains that you wear a “white shirt because white signifies winter and the colors signify the colors of spring.” Festival-goers blossom with pinks, greens, yellows, reds and blues as they enter the cloud of colors. Sreerama believes the colors of Holi have taken on a new symbolism as the festival spreads to universities across America. “If you’ve noticed, the colors have made everyone look the same,” he points out, and the truth of his observation only gets clearer as familiar faces are easily lost in the crowd, all painted into one Jackson Pollock-esque portrait. “Holi shows that everyone is really the same. Skin color, race, creed, wealth, lack thereof, doesn’t matter. Everyone is still a human being and we should all just be happy and enjoy life,” Sreerama says. DJ Chett echoes this sentiment as he admires the crowd from his spot on the stage, announcing that his favorite thing about the festival is “all the colorful diversity” of the attendees themselves. “Only at the University of Texas,” he boasts between songs, and the crowd returns his enthusiasm with more color thrown into the sky. 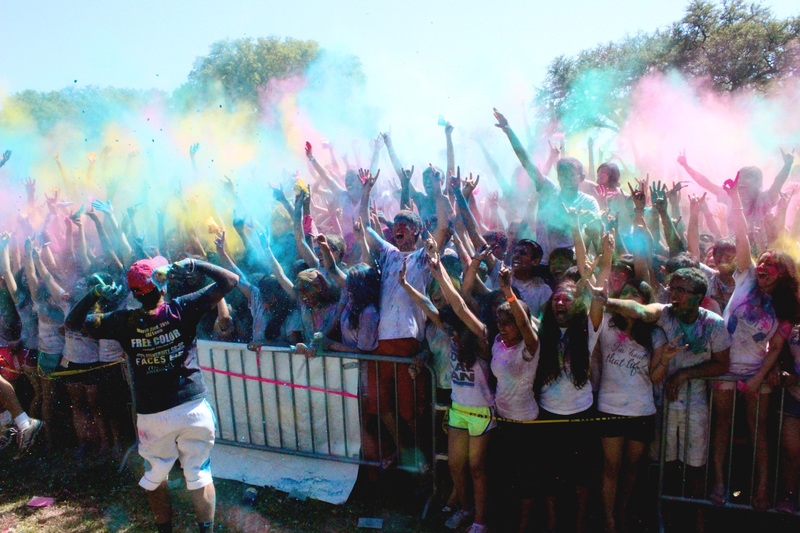 DJ Chett’s pride in UT’s Holi festival is indeed well deserved. Sreerama shares that, nearly doubling in its attendance from previous years, “this Holi is one of the largest at a university, if not the largest in the country, and definitely in Texas.” He says that it far outnumbers Texas A&M University’s Holi festival — which is the second closest in attendance with 500 to 600 attendees — and is almost as large as the citywide festival in Houston. “It’s been growing exponentially since it started with a couple hundred attendees in 2009,” he marvels. The Hindu Student Association has worked diligently this year to improve the quality of the fest. Their efforts included moving the location to a much larger space, spending three to four times on professional sound and preparing over 670 pounds of color. “Eighty percent of [Hindu Student Association’s] budget comes directly from the University, and that really shows how forward-thinking, how supportive, the University of Texas really is,” Sreerama says. Another unique aspect Sreerama highlights about UT’s festival is that, in collaboration with UT’s Green Events, Holi is a completely green event. “Everything we use in this fest — all the packages, the color, everything — is completely biodegradable,” he explains. It was also completely free to attend. Sreerama says that the purpose of the festival is two-fold. “I honestly believe that the most important part is having fun and spreading that joy, but it’s still something that we strive for, to have everyone learn something new about Hindu culture,” he says. Sreerama explains that although many people only view Holi as a colorful party, he still sees it as an opportunity to share his culture. “Not only are we Indians, not only are we Hindus, we’re also Americans, we’re Indian-Americans, we’re Hindu-Americans, and this is our home,” he adds. At the end of the fest, DJ Chett wraps up with a popular Bollywood song, which keeps everyone dancing until the last second when he is cut off by the security staff. Sweat creates rainbow streaks down tired, smiling faces. The festival is closed with a Hindu prayer, or puja, and then suitably, the Eyes of Texas and the Texas Fight Song. However miraculous it may seem that the colors wash clean out of your clothes after the first laundry run, it is sad to see the them go. Sreerama admits on his Facebook, “This event has a little piece of my sweat and blood in it. This will definitely be one of the greatest memories of my life,” he concludes.